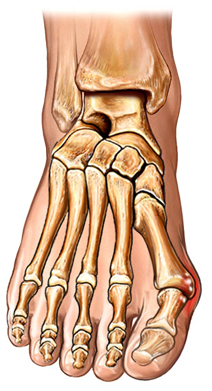 A bunion is a thickened lump at the base of the big toe. It is the result of the movement of the base of the big toe away from the smaller toes. At the same time, the end of the big toe moves toward the smaller toes. This instability creates metatarsophalangeal (MTP) joint inflammation and bursitis at the base of the big toe. The exact cause of bunions is unknown, but it is likely a combination of genetics and environmental factors. You should seek medical attention if you have diabetes and you are having problems with your feet. You will be asked about your symptoms and medical history. A foot exam will be done. An x-ray of your foot will be used to diagnose the bunion. It will also show the severity and amount of damage. Prescription or over-the-counter medications and/or cortisone injections may be advised to reduce pain. A physical therapist will assess the bunion. Ultrasound may be done to help relieve inflammation and pain. Wear wide toed shoes and comfortable footwear that do not pinch the toes. Prevent a minor bunion from worsening with bunion pads and proper shoes. Bunions. Ortho Info—American Academy of Orthopaedic Surgery website. Available at: http://orthoinfo.aaos.org/topic.cfm?topic=A00155. Updated February 2016. Accessed March 13, 2018. Bunion surgery. Ortho Info—American Academy of Orthopaedic Surgery website. Available at: http://orthoinfo.aaos.org/topic.cfm?topic=a00140. Updated February 2016. Accessed March 13, 2018. Ferrari J, Higgins JP, et al. Interventions for treating hallux valgus (abductovalgus) and bunions. Cochrane Database of Syst Rev. 2004;CD000964. Hallux valgus and bunion. EBSCO DynaMed Plus website. Available at: http://www.dynamed.com/topics/dmp~AN~T115604/Hallux-valgus-and-bunion. Updated November 22, 2017. Accessed March 14, 2018. Maffulli N, Longo UG, Marinozzi A, Denaro V. Hallux valgus: effectiveness and safety of minimally invasive surgery. A systematic review. Br Med Bull. 2011;97:149-167.